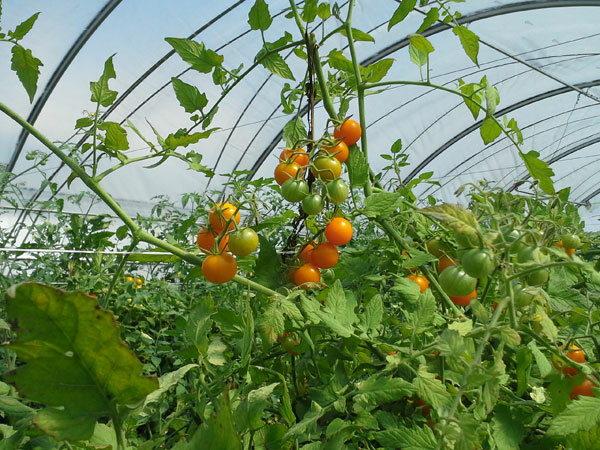 The summer vegetables are winding down at the farm, including the tomatoes. 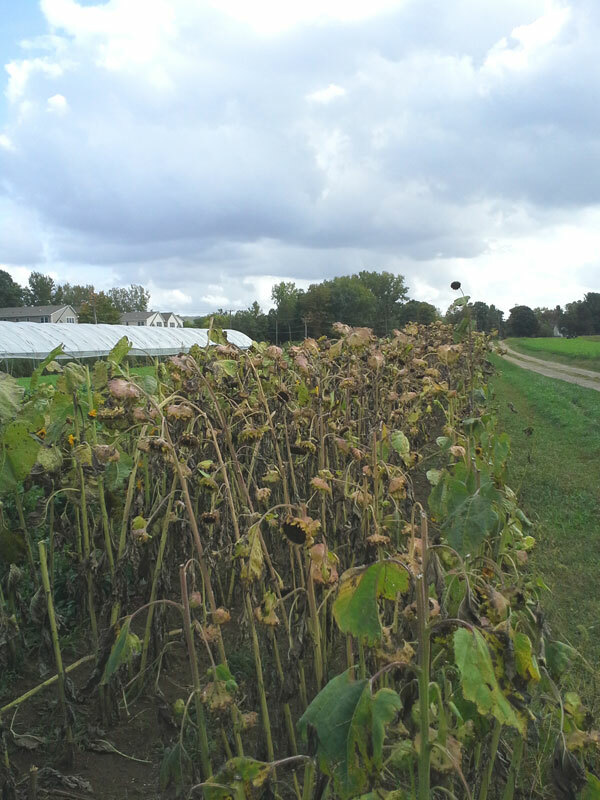 The plants are drying out and they look a little mangy. 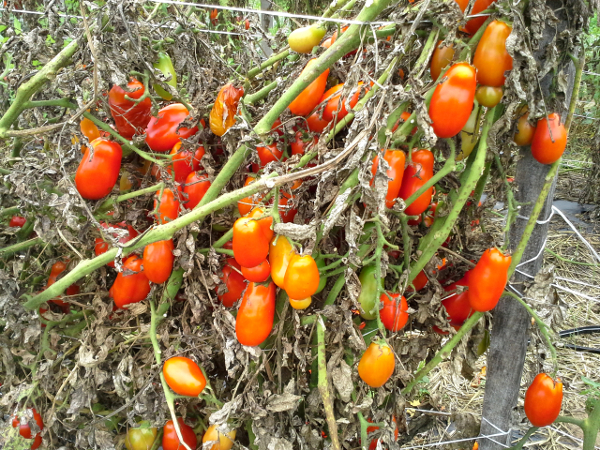 A number of the tomatoes are past their prime and some have fallen off the vines. 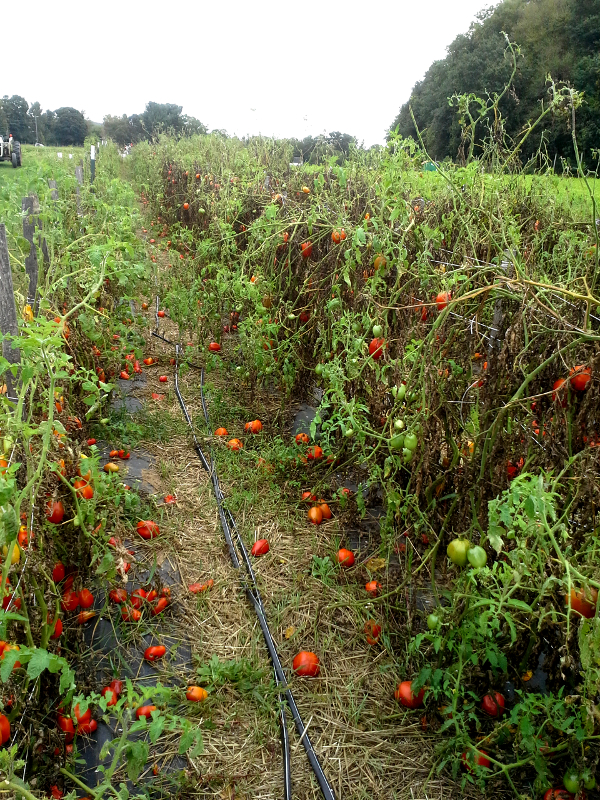 There are still enough good tomatoes to pick, though. And even if they aren’t as picture-perfect as the tomatoes in July, these late-season ones are still packed full of nutrition and they still make delicious tomato sauce. Many people assume they’re too old or too young for success, or that they’re too tall or too short, too skinny or too husky. Some people think they aren’t smart enough or that they don’t have the right connections. Others think they are the wrong gender or color so they figure they can never be successful. NOT TRUE!!!!!!!!!!!!!!!!!! NONE OF IT!!!!!!!!!!!!!!!!!!!!!!! The world is starving for your special knowledge and experience, your unique talents and abilities. It doesn’t matter what you look like, where you grew up, or who your family is. You are exactly the right person to make your dreams come true. What matters is you taking your own dreams seriously, making a plan to bring them to fruition, and then following through with that plan one step at a time. Your homework is to take the next step. Break it into tiny bits that can easily fit into your schedule; tiny bits that are a snap for you to complete. Then do them! 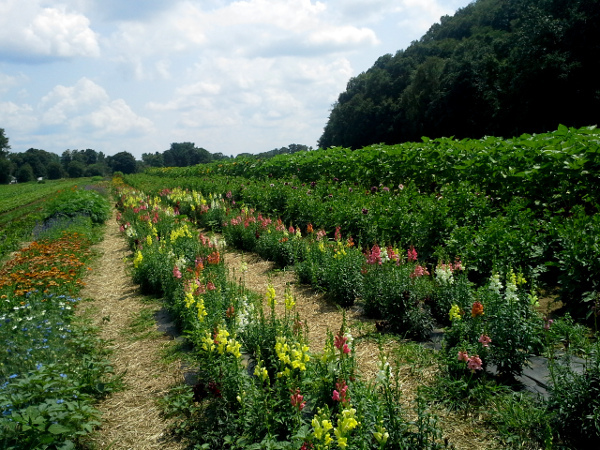 Yesterday I was at the farm picking up my weekly share of garden fresh vegetables. 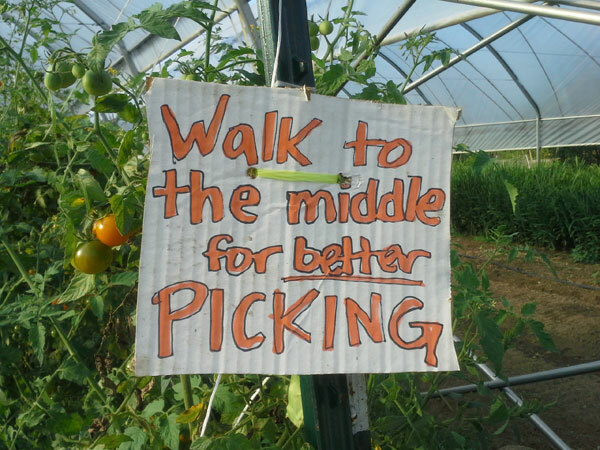 For the pick-your-own portion, the farmers will often leave instruction signs in the fields telling shareholders where the best picking is. 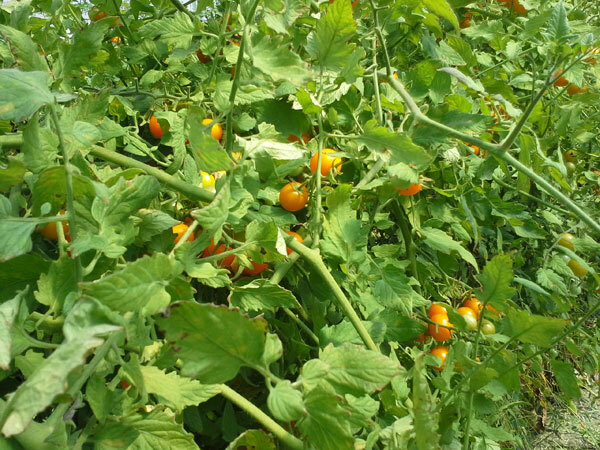 The tomato patches are one of the areas. I overheard a child reading the sign to his mother and I was amazed that the mother insisted on staying near the beginning of the patch. When she mentioned that there were few ripe tomatoes, her son reminded her of the sign. But then she declared that “the sign must have been leftover from another week because, obviously, the tomatoes were done for the season. ” All they had to do was walk just a few feet down the row–not far at all from where they had been standing–and they would have easily filled their pint for the week! 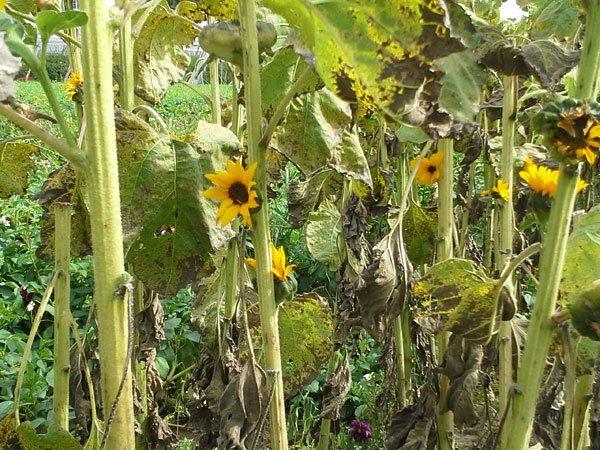 Instead, because the mother thought she knew better than the experts–the farmers–the family left without getting their share of tomatoes. …about all the times I’ve disregarded information from the experts–suggestions that could have saved me countless hours of effort! I didn’t take the time to think it through, to discover how to apply the information to my situation. Your homework today is to take a moment to think through the information you get from others who have traveled the road before you. Perhaps not all of their advice applies, for instance your circumstances may be different or new knowledge or technology has come along since they traveled where you are now. Even so, there are nuggets of gold in there for you so don’t dismiss the message right away! Think it through. Take in the information, but then run it through your evaluation filters. Ask yourself questions such as: Does this apply to my situation; can I adapt this to my particular circumstances; does this information spark a better idea that’s just right for me? 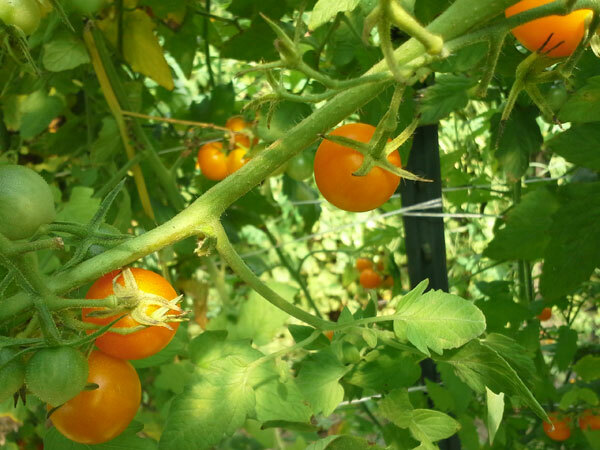 Wisdom from the Farm: The Cherry Tomato Patch: Look Up! Look Inside! Part of my share from the farm this week was a quart of pick-your-own cherry tomatoes. 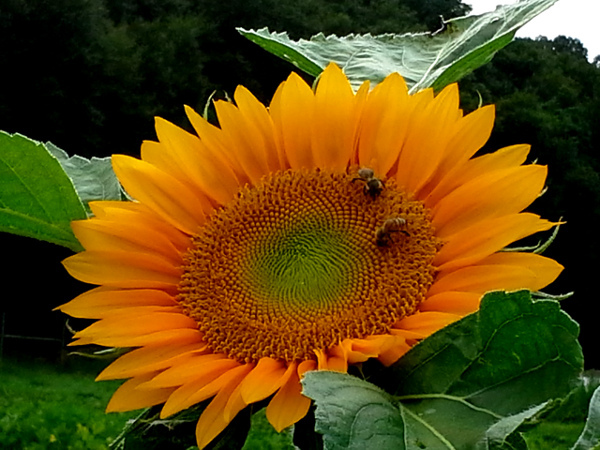 There are several varieties available and I always choose the Sungold because they seem sweeter. And, I like their orange color! 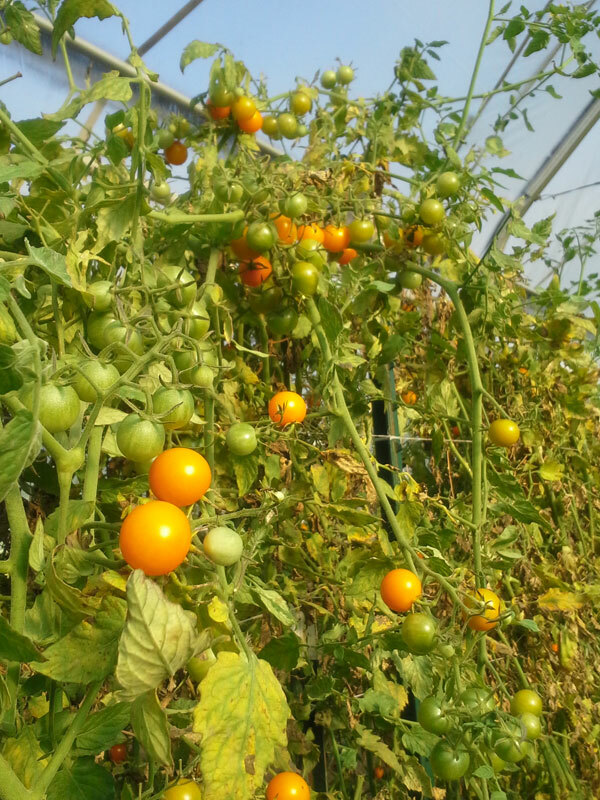 Even though there are plenty of tomatoes for all, when you’re looking at the plants, it seems as though the pickings are slim. That’s because you have to look beyond the surface. You must move aside the leaves and look toward the center of the plant. 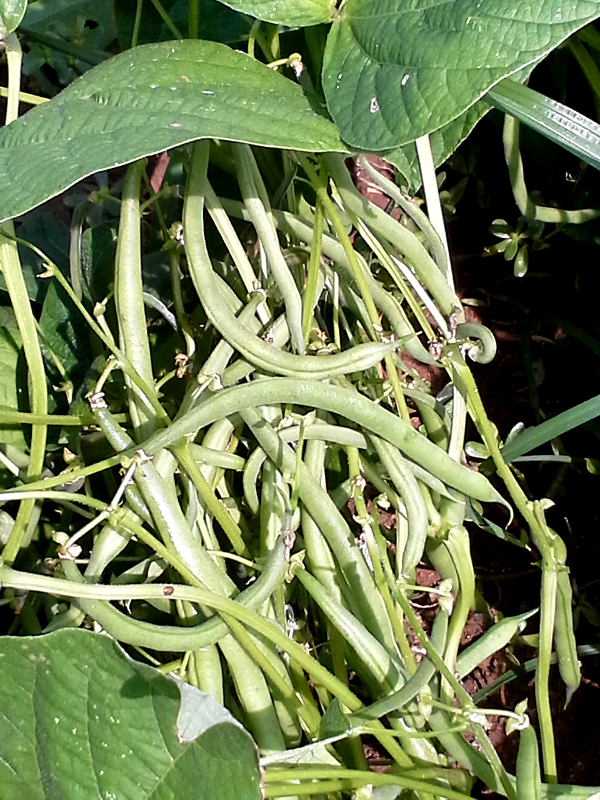 And, you have to look up–above eye level–to find the sweet, ripe ones. When we’re looking for the gifts within the problems we’re working through, we oftentimes don’t see the gifts–or see only the obvious ones–because we’re focused on the surface. We’re so intent upon working our way through the rough patch as quickly as possible (naturally so) that we may miss the profound and valuable gifts. If we would take a moment to pause in the midst of the rough patch and thoroughly consider it from all angles–including delving below the surface–we may find a pathway through that develops more subtle skills, abilities, and talents that then take us to heights we never dreamed possible. Your homework today is to stop frantically bashing around in the rough patch. Take a moment to clear your head. Then take a look at the problem from all angles, including looking down on it from above and looking up at it from below. And by all means, dig a little deeper than just the surface of it! Ask yourself: What if this rough patch was the greatest gift to me. What about it would make me say that–how can this be the greatest gift to me? Also ask: What gifts, beyond the obvious ones of building strength, character, and persistence, can I find as I delve deeper? Then give yourself the task of finding the answers to those questions. Then probe into the inner recesses for those answers. For instance, if you determine that this rough patch will teach you resilience, what specifically are you learning about resilience? Previously in your life you’ve probably had opportunities to develop resilience. But that resilience that you’ve already learned is not enough in this particular rough patch. So what deeper aspect of resilience do you now have the opportunity to learn about and strengthen? Take the time to ask these questions and do the work to answer them. It’ll make going through this rough patch a much more profound experience for you. 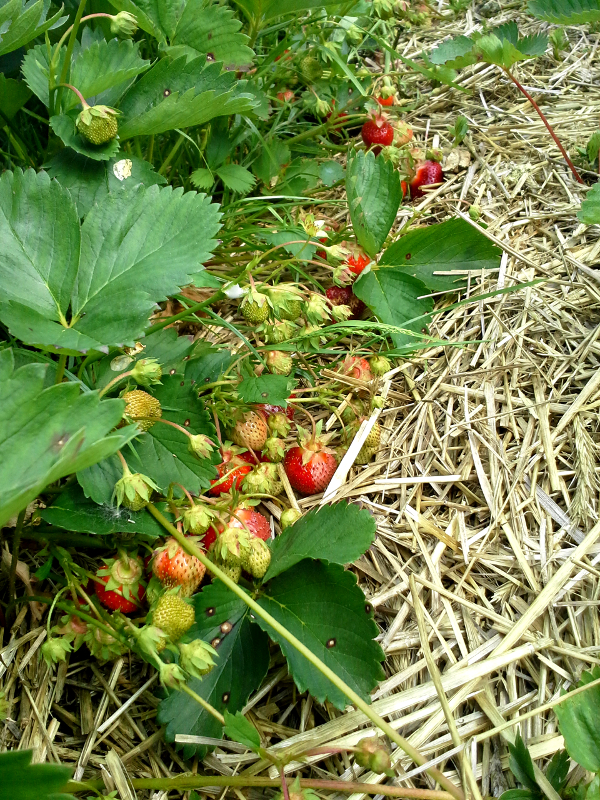 Strawberry time at the Farm—yay! 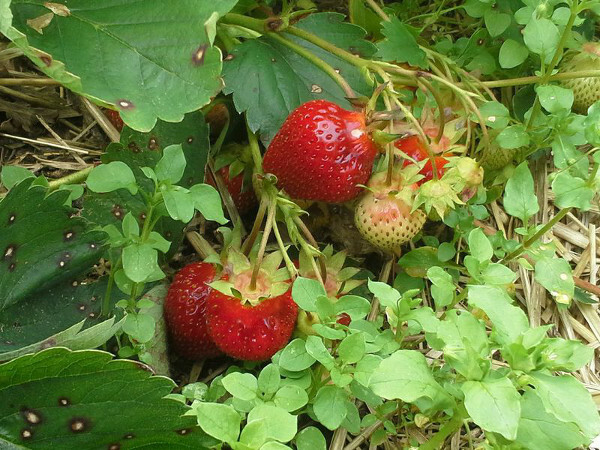 Most people picked the strawberries from the edges of the plants—the berries that were closest to the path. 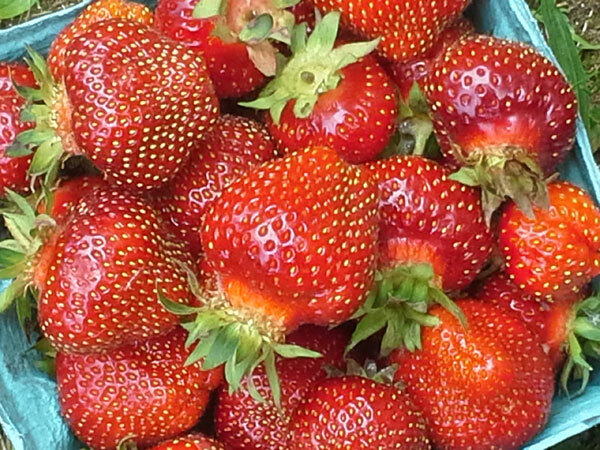 Since this was the first week of picking strawberries, it was fine to take the one from the edges because there were plenty to choose from. For kicks I thought I’d also check inside the rows, dig a little deeper, and look under the leaves and toward the center of the plants. 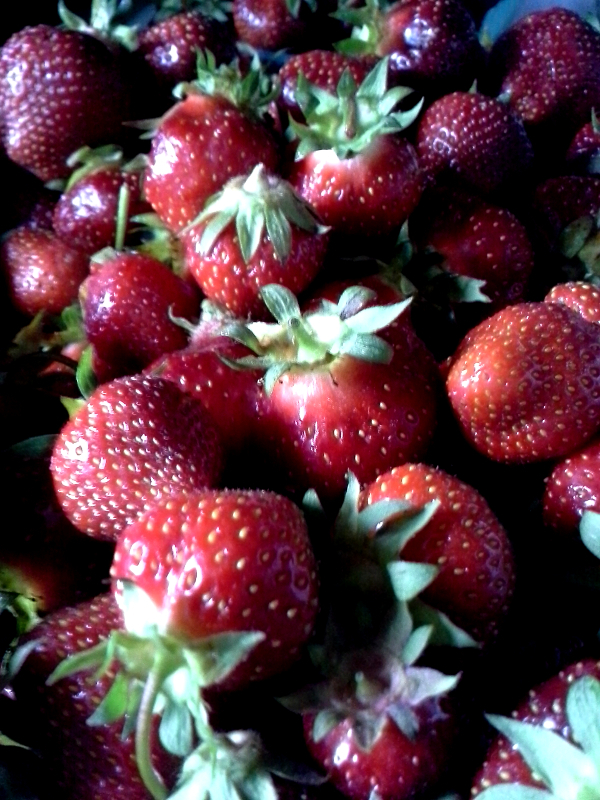 I was rewarded with several fat, ripe strawberries! WooHoo! How many times do we try to go for the easy solution to a problem? And how often do we run with the first idea that presents itself to us? Perhaps we can take a moment and dig a little deeper. Sometimes ideas and solutions do work right off the bat, but other times they may benefit from a little more thinking on our part. Perhaps even some turning them this way and that to see if there’s a better way to do things. Your homework today is to give it a try and let me know how it works! I’m so proud of you—you’re awesome! !